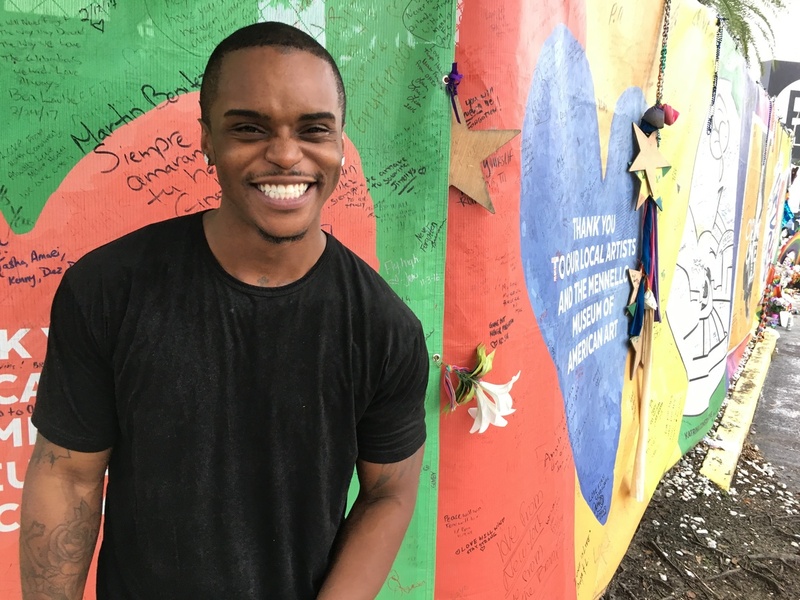 One Year After Pulse Shooting, Orlando Honors Those Who Died : The Two-Way Hundreds gathered outside the nightclub Monday to remember the 49 people who were killed that night. Mourners have created a makeshift memorial there — and plans for a permanent one are underway. Answai Bennett was shot at Pulse that night. His best friend died in the shooting. Outside the nightclub, the Associated Press reports, hundreds of people gathered in the early hours of the morning, as the names of all of the 49 victims were read aloud. The AP reports that the recitation of names began just after 2 a.m., the time that Omar Mateen began shooting, during the gay club's "Latin Night." "I realize that gathering here in this place, at this hour, is beyond difficult," Orlando Mayor Buddy Dyer said during the service, according to the AP. "But I also know that the strength you've shown over the past year will carry you through today and in the future." All Things Considered host Ari Shapiro traveled to Orlando last year after the shooting; last week he returned to talk to survivors and others about their recovery. Answai Bennett, 26, was one of those shot that night. He has a line on his hip six inches long marking where he was shot; doctors told him he'd probably never walk the same way again. After a year of physical therapy and going to the gym, his limp is gone. As Ari reports, Bennett recently came back to Pulse for the first time in almost a year. 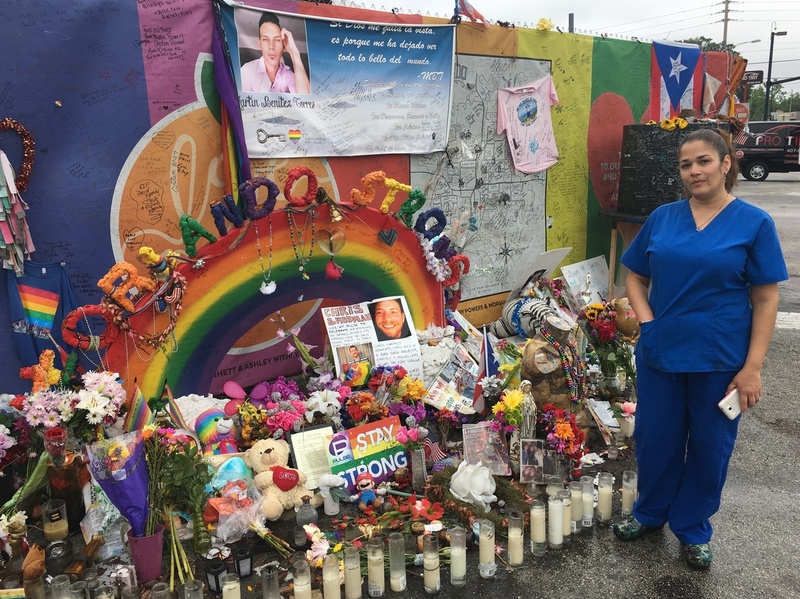 Olivia Baez, a nurse at Orlando Regional Medical Center, cared for victims of the shooting that night. She says she comes to the Pulse memorial nearly every day. "I just felt like I could hear them if I was praying here and talking here. Like I could come here and talk with my friends." Among Bennett's friends who died that night was Paul Terrell Henry. "Paul, I think about every day," he says. "He was a part of my everyday life. He was my best friend, so I think something about him every day." Olivia Baez, a nurse at Orlando Regional Medical Center, cared for victims the night of the shooting. She says she comes to the memorial outside Pulse almost every day. "I still come back sometimes and go back to that night, and it's like I know we need to go on with our lives, especially with the type of work that I do. I know a lot of people say divide the work and the personal," she says. "You can't. Not in this case, you can't do that." Florida Gov. Rick Scott ordered the state's flags flown at half-staff Monday, which he declared Pulse Remembrance Day throughout the state. Terry DeCarlo, who runs an LGBT center in Orlando. 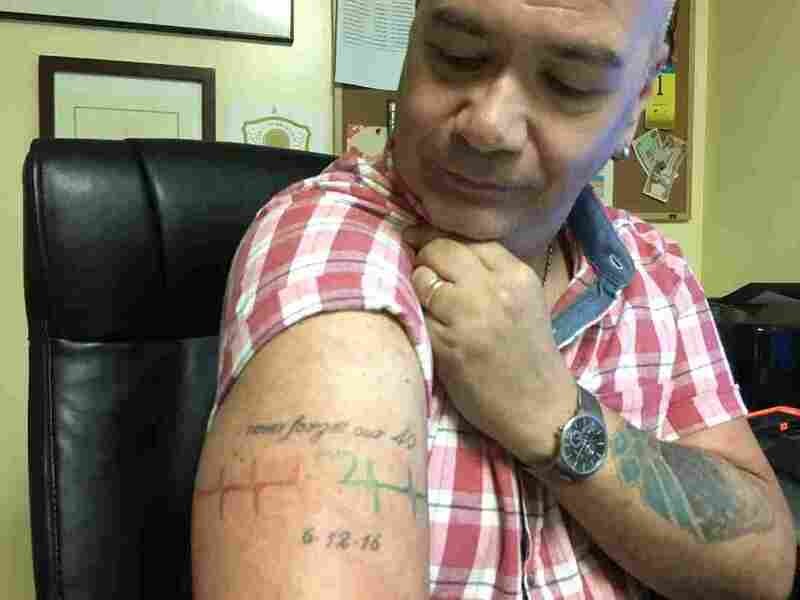 He got a tattoo to honor those who died that day. As Amy Green of member station WFME reported Sunday, Pulse owner Barbara Poma is turning the building into a memorial and museum. Two groups of survivors will oversee the effort, funded by Poma's onePULSE Foundation; eventually she will solicit bids from designers. "We have no idea how long it's going to take," said Poma. "We don't know if it's going to be one year, three years, five years. And I think putting a time on it is unrealistic. ... [Some] people aren't ready yet." Mayra Alvear, whose 25-year-old daughter was among those killed in the attack, hopes the memorial will be a space of peace. "My daughter's life was taken there and so many others," she told Green. "And somehow, when I visit there, it's just like the angels embrace me somehow. It's just I feel their love, you know? ... And I don't want that feeling to go away."